"Spoonbills Roosting in High Island, Texas." The day after Easter 2012, I was able to drive down and visit High Island, Texas. 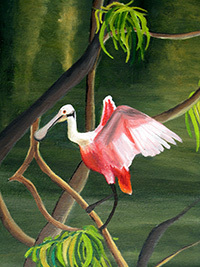 It is well known for all the birds that stop there as they migrate between Central and South America and North America. It is located very close to the Gulf of Mexico so I suppose the birds are ready to rest after all that flying over water. Thankfully, God allowed me to be there on a day where there were birds of every color flying around. My favorite part was an area where you can view hundreds of birds roosting and nesting. Everything from mom and dad birds bringing sticks to make nests to baby birds sitting on thier nests. 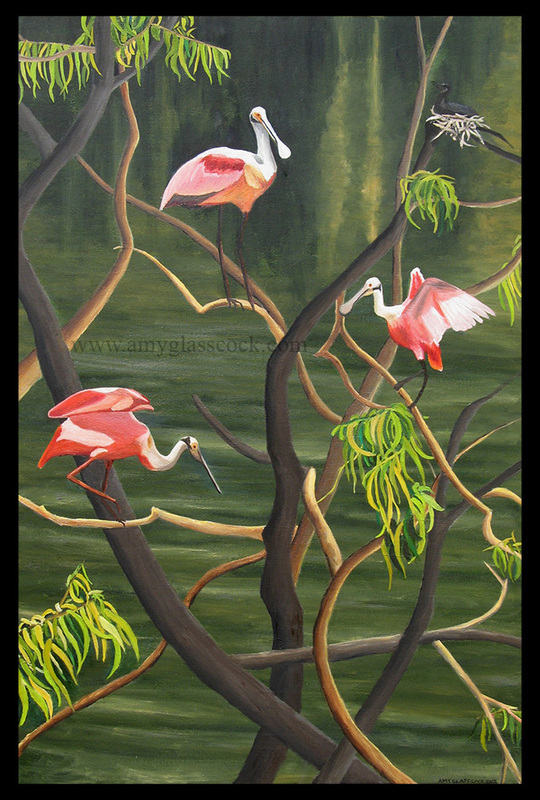 I chose the Roseate Spoonbill birds to paint because I love how colorful they are and I love the lines of the tangled branches that they were resting on. I am glad that they somehow know to stop in High Island every year and that God created them with GPS.